Searching for great holiday deals? Been wishing for that new hunting gadget or the latest gear? No need to hunt around! HuntingNet members can get special deals and fantastic offers right here! $100 off all individual rings priced at $200 and above. If you love camo, or you’re looking for the perfect gift for that special hunter in your life, look no further. 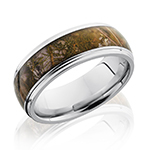 Upgrade that plain wedding ring with one that showcases their love of the outdoors. We also have pink camo wedding rings for ladies and hunting themed bands! Play, Shoot, Hit, and Win! 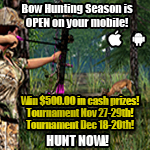 Bow Hunter2015 is an action Bow Hunting Simulation for Android and iOS mobile devices where winners can win $500.00 in real cash gift cards to their favorite outdoor retailer for great bowhunting skills! Players can hunt from Treestands or by Stalking through detailed 3D terrains. Click to win $500 in real cash gift cards! 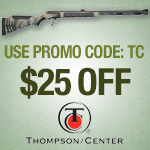 Muzzle-Loaders.com is offering $25 off any Thompson Center Triumph Bone Collector muzzleloader through the end of the year! Call for special pricing on combos with Leupold or Nikon scopes! We offer the biggest selection of muzzleloaders and supplies! Call us today at 855-236-5000.